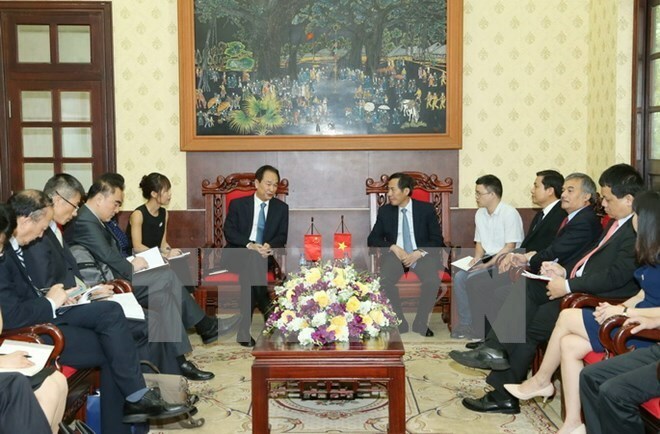 Hanoi (VNA) - Editor-in-Chief of Nhan Dan (People) newspaper Thuan Huu hosted a reception on May 25 for President of China’s Xinhua News Agency (Xinhua) Cai Mingzhao who is on a visit to Vietnam from May 23-27. During the meeting, the host appreciated the significance of the visit, and highlighted the traditional cooperation between Nhan Dan newspaper and the China Daily newspaper. Huu told his guest that Nhan Dan newspaper receives many delegations from Chinese press agencies every year, contributing to promoting exchange and communication links between the two nations. Cai Mingzhao, who is also a member of the Communist Party of China Central Committee, stressed that Party and State leaders of the two countries attach special importance to cooperation between the two Party newspapers (the Nhan Dan and the China Daily), and between the two State-run news agencies (Vietnam News Agency and Xinhua). He urged mainstream press agencies of Vietnam and China to enhance collaboration, exchange of visits, and information sharing, thus further fostering the friendship and mutual understanding between their peoples. Xinhua is willing to provide services and products for Nhan Dan newspaper through Xinhua’s office in Vietnam, he said.